Mariah Carey ended her 16-year Grammy drought by winning three trophies Wednesday, but her hopes of making Grammy history were smashed as rock gods U2 won five awards, including album of the year and best rock album for "How to Dismantle an Atomic Bomb." 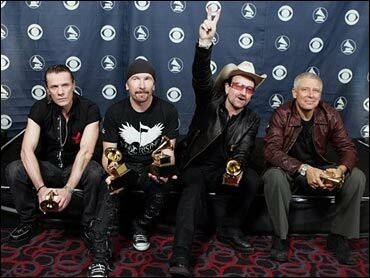 U2's trophies included song of the year for "Sometimes You Can't Make it On Your Own," written by Bono in memory of his father, a postal worker who sang opera in his spare time and who Bono credits as the man who gave him both an attitude and a voice. "If you think this is going to go to our head, it's too late," said Bono, carting off yet another trophy. As for the experience, well - "Being in a rock band is like running away with the circus," said the U2 frontman, "except you always think you're gonna be the ringmaster. You don't expect that on more than a few occasions you may look ... the clown, the freak." Guitarist The Edge said the awards mean a lot to the group, "but even more precious than the awards is the gift you've all afforded us - you've allowed us to continue to make our music." U2 provided one of the more rousing performances in the jam-packed show as they sung their hit "Vertigo" and then joined R&B queen Mary J. Blige's for their classic "One," which has become an anthem for Bono's activism on behalf of the poor. It's not the first time that Blige and Bono have teamed up – the two performed the same song last fall in one of the televised benefits for victims of Hurricane Katrina. Alicia Keys and Stevie Wonder energized the crowd as they introduced the first award. Wonder pulled out his harmonica and the two soulfully sang his classic "Higher Ground" as a tribute to the late Coretta Scott King, whose funeral was on Tuesday. "Let's keep trying to reach that higher ground," said Keys. "I forever want to reach that higher ground." John Legend beat out Wonder, Keys, Fantasia and Earth, Wind & Fire to snag best R&B album for his platinum debut, "Get Lifted." He picked up his second trophy for best male R&B vocal for "Ordinary People." Alison Krauss & Union Station also had three awards each, including for best country album, while Wonder, who released his first album in ten years last year, also won two. John Prine surprised himself, as he won best contemporary folk album for "Fair & Square." "I didn't expect to be up here," said Prine as he claimed his trophy. "I showed up because I got nominated. All the other nominees are sitting at home in my record collection." For Mariah Carey – one of the best-selling artists of all time – it was a good night, but not one for the history books. She had been nominated for eight Grammys – an opportunity to make history, since no woman has ever won more than five in one night – and did win three. But those awards were on the list of those handed out before the televised ceremony, so even though she won – her first since two Grammys as a newcomer in 1990 – Carey was shut out throughout most of the show that America saw. Mariah Carey was this year's comeback queen, overcoming personal difficulties and a career slump of a few years ago to emerge in 2005 with the most popular album of the year, "The Emancipation of Mimi." Carey lost best female pop vocal performance to Kelly Clarkson's triumphant "Since U Been Gone," song of the year to U2 and record of the year to Green Day. Kelly Clarkson, who also won best pop album, also helped steal some of Carey's spotlight. "I'm sorry I'm crying again on national television," said Clarkson, the former "American Idol," tearful and shaking as she held her first Grammy. "Thank you so much, you have no idea what this means to me." Kanye West's three Grammys matched his total for last year. The brash rapper/producer played up (or lived up to) his egotistical reputation as he won best rap album for "Late Registration. "I had no idea, I had no idea," West said in mock shock as he pulled a huge sheet of paper that read "Thank You List." "Imagine being my publicist, how hard that's gotta be," joked West of his victories, a contrast to some of the other times he's made news: a few weeks ago, posing for Rolling Stone wearing a crown of thorns, and last fall in a broadcast of a hurricane victims benefit, where he got censored after saying President Bush "doesn't care about black people." Politics did make an appearance at the Grammys, as Illinois Senator Barack Obama won in the best spoken word category for his readings from his autobiographical "Dreams From My Father." Songwriter Burt Bacharach, whose dozens of top ten hits over the years include "Close to You" and "Say A Little Prayer," won best pop instrumental album for "At This Time," with lyrics attacking Bush administration foreign policy. "I never like to be lied to by a girlfriend or agent and certainly not the president of the United States," said Bacharach, explaining why, at 77, his work turned decidedly political. The show started off on a two-dimensional note as the cartoon-fronted rock group Gorillaz performed their record of the year contender, "Feel Good Inc." with the help of animation, a blue screen and guest rappers De La Soul. The performance then segued into a Madonna moment, as the pop queen - who was not nominated for any awards - sang her latest hit, "Hung Up," with a chorus of dancers behind her. Former Beatle Paul McCartney was featured in one of the night's most intriguing combinations, walking onstage to sing "Yesterday" with rockers Linkin Park and rap mogul Jay-Z. Earlier, he played one of the Beatles' hardest rockers, "Helter Skelter," but went home without a Grammy. One of the biggest surprises was the appearance of Sly Stone, the mercurial, psychedelic pioneer who all but disappeared from the music scene decades ago. Toward the end of a sizzling all-star tribute, Stone emerged onstage sporting a tall blond Mohawk and breathed new life into one of his biggest hits, "I Want To Take You Higher." Though the tribute was planned, many really didn't expect Stone - who hasn't performed in public in 13 years - to show up. Keith Urban was answering questions backstage when Stone's performance began playing on a nearby monitor, and he had to stop talking. "I think we just got upstaged," Urban said in amazement. "Everything pales in comparison."